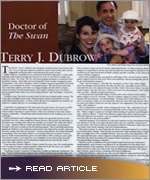 The day Dr. Terry J. Dubrow was accepted to medical school, his dream came true. As a young man inspired to make his mark on the world, there was no imaginable profession more satisfying than the power to heal. Today, Dubrow—husband of successful actress Heather Paige Kent—is also experiencing a little Hollywood glamour himself, as a star on television’s number-one makeover show, The Swan. The Fox television program attempts to transform 20 despondent women—physically and psychologically. Each woman is assigned a team of specialists: a life coach, therapist, trainer, cosmetic surgeon, and dentist who work together to accomplish the show’s conceptual mission. The end of each show pits two contestants against each other as a string of judges decides which woman achieved a better overall transformation. The winner continues on to the show’s beauty pageant finale where one of ten self-proclaimed “ugly ducklings” is declared The Swan. Needless to say, the show is controversial. In the eyes of many public viewers, The Swan takes 10 fragile women who undergo plastic surgery from head to toe and sends them home as losers. To these critics, the show accomplishes the antithesis of Dubrow’s original objective for attending med school. Long before he appeared on The Swan and even years prior to his service as chief resident of general and plastic surgery at UCLA, Dubrow sat in one of his med school classes, listening to a guest lecture, with every intention to become a heart surgeon. Admirable—considering cardiovascular disease is the leading cause of natural death. Dubrow listened as the visiting professor projected a gruesome picture on the overhead. Even for a class composed of future doctors, this picture was shocking. In the photo was a woman who survived a horrible car accident. Her whole face burnt to a crisp. Stunned, Dubrow could only think of the unfortunate circumstances brought to this poor woman in this life-altering tragedy. Then something miraculous happened. Dubrow’s eyes widened as that picture was replaced by another, depicting the same woman also after the accident—except in this picture, she looked beautiful. Astonishing! There was little evidence a car accident had ever occurred. It was almost as if this woman had been given a second chance. Who could give such a gift? The miracle worker, as it turned out, was exemplary of the same group of people sometimes deprecated for performing breast augmentations and tummy-tucks— none other than a plastic surgeon. From that day forward, Dubrow’s future couldn’t be more clear. He would publish over 25 papers in major surgical journals, author the book The Acne Cure, and become one of America’s foremost plastic surgeons. “Speaking of plastic surgeons, it’s important to make an important distinction,” he says. “Board-certified plastic surgeons and cosmetic surgeons are not the same.” In reality, just as passing the bar allows a lawyer to practice any field of law, a medical school graduate can legally claim to be a specialist of his or her own choosing, with or without residency training in that specialty. Thus, any med school grad can perform cosmetic surgery given the proper operating facilities. So when picking a plastic surgeon, it’s important to choose one that has gone the extra length in education to be certified by the American Board of Plastic Surgery and also a member of the American Society of Plastic Surgeons. Given these qualifications, one question still lingers: How can any board-certified plastic surgeon perform effectively when surrounded by cameras strategically placed by the entertainment industry? “Easy,” answers Dubrow. “Just like the contestants, at first I was a little uptight about the thought of being filmed. But after the first day, especially because of how concealed they are, the cameras became invisible. I don’t even notice them. Once the surgery begins, I get into the zone. I don’t even notice the time going by.” How much time, you ask?-usually around seven hours! Logically speaking, in an industry as risky and expensive as the entertainment business, producers of any successful television show cast very carefully. Going into its second season, The Swan would lose all integrity if half its contestants (those that are sent home) went home unhappy with their transformations. With that in mind, we can’t forget that the show’s conceptual mission is to achieve an overall positive change. These women do much more than undergo plastic surgery. They are taught how to live a healthy lifestyle. Two out of five team specialists-the life coach and therapist-aim to improve non-physical attributes of each contestant. And when the show does depict the surgical-related experience, it is realistic-often showing swelling, bandages, and pain. Moreover, just to emphasize the psychological importance of each contestant’s transformation, each woman is not allowed to see themselves for the whole three-month duration of the program. All the mirrors in their living quarters and gym are either covered or taken out. Only at the end, are their figures unveiled. The contestants’ reaction: almost always screaming with tears of happiness.